Left: George Richmond, Charlotte Bronte, 1850. Right: Jane Eyre, First Edition, 1847. Images via the Morgan. “In Memory of Charlotte Nicholls,” the plainly printed, black and white memorial card from 1855 reads. The card, which is included at the end of the Morgan Library and Museums’s exhibition, “Charlotte Brontë: An Independent Will,” is almost startling to see, a simple reminder that the author of some of English literature’s most enduring female protagonists had, at the end of her life, taken a new name. Virtually nobody recognizes the name Charlotte Nicholls, though that was who Charlotte Brontë, recently married to Arthur Bell Nicholls, was when she died at the age of 38. Though Brontë had many names—from Mrs. Nicholls to Currer Bell—what endures is her particular boldness. Memorial Card, 1850. Image via the Morgan Library. “My goal was to present ‘bold Miss Brontë’ not ‘poor Miss Brontë,’” Christine Nelson, the curator of the exhibition told Jezebel. “Poor Miss Brontë,” Nelson notes, is how Elizabeth Gaskell described Brontë to her friends as she was preparing The Life of Charlotte Brontë, a salaciously fun biography that became the source for some of the most enduring Brontë stereotypes. Gaskell’s Brontë was simultaneously an otherworldly creature reared at the gloomy Haworth Parsonage, a tragic figure whose life was defined by loss, and a socially awkward small-town writer. How much of Gaskell’s portrait of Brontë is accurate is debatable yet her rendering abides. Nelson has gathered nearly every relic associated Charlotte Brontë—from Branwell Brontë’s portrait of his famous sisters to the miniature books, fair copies of the novels, letters, and watercolor paintings—and framed them with an appealing installation and intellectual narrative. Thackeray Dress, c. 1850. Image via Graham Haber/Morgan. The exhibition is largely chronological but begins with the so-called Thackeray Dress (c. 1850), a printed delaine dress that is one of the “few surviving garments” associated with Brontë. The dress is surprisingly small—perhaps even dainty—even by the standards of the nineteenth century. Brontë stood about 4'9 and Nelson said that Brontë’s surviving corsets indicated that she laced tightly to get her waist down to about 18 inches. “I wanted it to be the first thing that people saw because it’s a powerful evocation of Bronte’s presence,” she added. While the Thackeray Dress gives a sense of Brontë’s physicality, it also offers an opportunity to revisit a well-known story about the writer. According to an oft-repeated story, Brontë wore this floral printed dress to an evening party at the home of fellow writer, William Thackeray. The night was an infamous bust; Brontë was notoriously shy and one guest described the evening as, “one of the dullest evenings she ever spent in her life.” Brontë’s poor conversation skills, combined with the wildly inappropriate day dress she supposedly wore to the dinner, made the evening a memorable one. But the dress part of the story is likely untrue. Nelson notes that the scholar Eleanor Houghton has convincingly argued that Brontë didn’t wear the Thackeray Dress but, more likely, wore a perfectly appropriate evening gown. “It added to the myth of her being out of fashion,” Nelson said. Nelson worked closely with the Costume Institute at the Met to dress the mannequin, making sure the petticoats were dressed properly, as they would have been in the 1850s. It took nearly a whole day to dress the mannequin and, during the process, the mannequin “ended up posed facing the wall as though Bronte was looking at her own will [which is hanging to the left of the dress]. It was really ghostly feeling,” Nelson said. “Everything in the exhibition evokes Brontë the woman—these things that she touched and owned—but I never wanted people to forget the reason that we’re here is because of her extraordinary words,” she added. In order to visually present that contrast between the writer and the woman, Nelson placed a message that Brontë famously sent to critics who were speculating about the gender of Currer Bell after the publication of Jane Eyre. “To such critics, I would say, I am neither man nor woman, I come to you as an author only,” Brontë famously wrote. Charlotte’s earliest surviving manuscript, c. 1828. Image via the Morgan. “It was very difficult to install,” Nelson said of the early manuscript. “All of the edges are different sizes and it was a really long process. We custom made brass cradles so they don’t scrape the manuscript.” The 1828 manuscript is one of the numerous minuscule volumes in the exhibition. There’s also the Bramwell’s Angria and the Angrians (1835), the book containing the imaginary universe that the Brontë siblings created together, Charlotte’s Second Series of the Young Men’s Magazine (1830), a youthful tribute to the kinds of magazines the siblings were consuming, and The Poetaster, a play she penned in 1830. Miniatures installed in the exhibition. “The Brontës were reading so widely. They were reading Shakespeare and Lord Byron, who was very racy, the novels of Walter Scott but also the news. They were reading news about the elections and reading satire,” Nelson said. “They were running with that and making that their own,” she added. The books are tiny for a number of reasons (the Morgan has magnifying glasses on hand to get a closer view of the manuscripts). The siblings had toy soldiers that were part of the games and the books are on scale for their toys. “In my opinion, it was also just fun,” Nelson said. The Poetaster, 1830. Image via the Morgan. From Brontë’s creative endeavors at Haworth, the exhibition moves to the time she spent at a boarding school, where she met her close friends and long time correspondents Ellen Nussey and Mary Taylor. It then moves to her time as a governess and teacher, to the “realization that she was going to have to make a living.” One of the letters from her time as a governess, written in January 1840, was done in pencil. In the letter, Brontë apologizes for the pencil, noting that the family she was working for was in the room where the ink was located. “She felt so out of place that she didn’t want to have to face the family to get the ink. It’s really poignant,” Nelson said. Branwell Bronte, Portrait of Anne, Emily and Charlotte, 1834. The famous portrait of the Brontë sisters done by Branwell is also a reminder of that moment. Though the portrait has since become an iconic image of the sisters, its wear and tear is a reminder that it was once just a domestic portrait of three average sisters, yet to become the writers we remember. Seeing the portrait in the context of the Morgan exhibition, alongside Brontë’s day dress, gives the painting an entirely different feel. In its normal home, the National Portrait Gallery in London, the teenage Brontës live with the other great names of English literature—just a few steps away from Vanessa Bell’s portrait of Virginia Woolf, for example. The NPG gives them a gravitas—that labeling of being great authors—that’s wonderfully missing at the Morgan. Installed here, Branwell’s portrait is simpler, stripped of the weight of a history it never knew it would carry. A presumed self-portrait, c. 1840. The exhibition finally turns to Brontë the professional writer, an endeavor that started off rather inconspicuously. The sisters’ first book of poetry, published under their nom de plumes, sold only two copies. “What strikes me about all of them is their incredible perseverance,” Nelson said. Besides their lack of sales, Charlotte had corresponded with the Poet Laureate Robert Southey. Needless to say, he was less than encouraging. Early attempts to publish her first novel, The Professor, were also met with resistance (that novel wouldn’t be published until after her death). Still, they all embarked on novel writing. 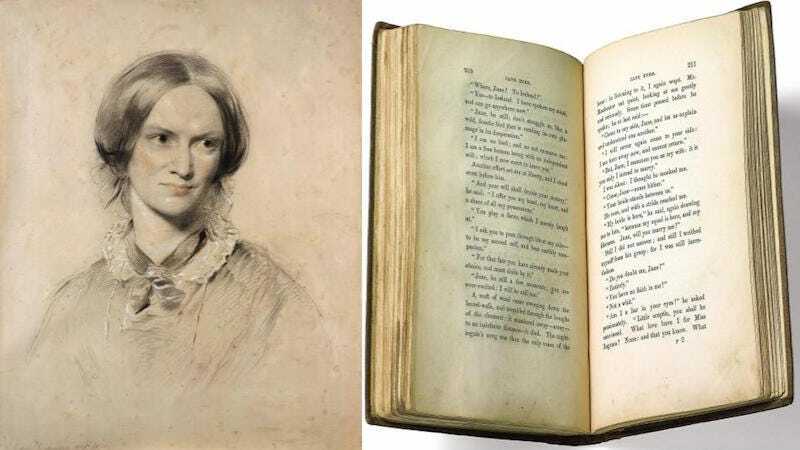 Finally, George Smith received The Professor and though he declined to publish the novel, he asked for a three volume work “from the pen of Currer Bell.” Despite the constant rejection, Brontë was almost finished with Jane Eyre and sent Smith a manuscript a few weeks later. Fair copy of Jane Eyre, 1847. And death is inevitably where the exhibition ends, the tangle of her last months, one of marriage, likely pregnancy, and Brontë’s early death. Hanging on the wall is Brontë’s final transformation—to wife. Her marriage certificate makes her value in the nineteenth century clear, Arthur Bell Nicholls is listed as a “Bachelor” and the under the box for profession, he’s listed as a curate. But Brontë, already the author of Jane Eyre, Shirley, and Villette, is listed as a “Spinster” and under the box for profession, a line is drawn through it, indicating that she had none. In the end, she might have simply been Mrs. Nicholls though, as the Morgan’s exhibition makes plain, Charlotte Brontë was much more than a spinster with no profession. Charlotte Brontë: An Independent Will runs through January 2.